Happy Cinco de Mayo! 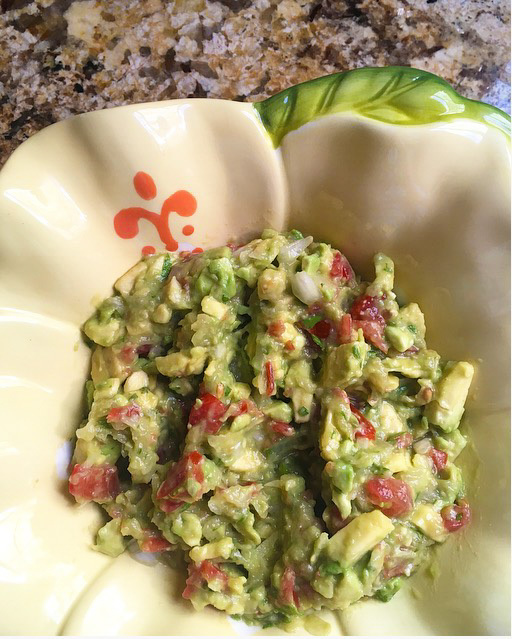 Today I'm sharing a recipe for one of my favorite foods: guacamole! It's surprisingly easy to create from scratch, and pretty healthy depending on what you choose to dip in it. My mom is the queen of guac - she makes the best homemade version, with chunks of avocado, tomato and fresh cilantro from her garden. I could eat guacamole on just about anything - tortilla chips, carrots, burgers, you name it! Looking forward to celebrating with margaritas & guac this weekend...hope you all have a great one! In a bowl, gently stir together avocados, onion & tomato. Try to not smash the avocados in order to keep the ingredients a little chunky and more flavorful. Squeeze fresh lime juice and stir. Add a little cilantro & coarse sea salt to taste. Enjoy as an appetizer with chips or veggies for dipping, or use as a topping - I love it on spicy black bean burgers. Girl this looks delicious!!! Need to try this now!! Oh I love guac!! Sounds like what I do though I have never grated the onion. Good idea so you don't get a big chunk. Oh this looks so good! I love finding guacamole recipes and switching mine up a little bit! I just wish it kept longer in the fridge! I know! We usually eat it fast enough so there aren't leftovers ha! Thanks Denise! I love guac, this looks so good! Yummy!! It must be really tasty!